How can you not buy a book with this title? Considering also that in the last period I feel like I can never leave the bed myself. 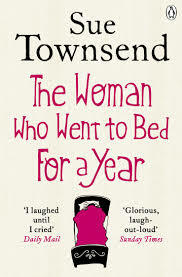 And also, the other book I read by Sue Townsend was hilarious (here). The day that her children leave from university, Eva decided to go to bed and to stay there for as long as she liked, forgetting to be both a mother and a wife. Of course her decision will create first worry, then anger among her close and enlarge family. Will she ever get out of bed? Is she getting depressed? But also, who will cook food from now on? And who will clean the house. The book is engaging at the beginning, witty and funny at times. And for half of the book I could also empathise with Eva. But after a while I found it lost all its sharpness, until the end of the book, that I found quite flat.